NEW YORK - MARCH 09: Cast member Ace Young (center) and cast of Hair perform at the Broadway cast change opening of "Hair" at Al Hirschfeld Theatre on March 9, 2010 in New York City. Following on the heels of NBC’s critically acclaimed rock musical “Jesus Christ Superstar Live in Concert” comes the true original rock musical, "Hair Live!," which will be broadcast in the spring of 2019 in front of a live audience. Craig Zadan and Neil Meron, who have executive produced each of NBC’s live musicals since "The Sound of Music" will executive produce the telecast. No cast has yet been announced for the production. Fifty years ago "Hair" burst onto Broadway in the midst of the anti-Vietnam War movement and was groundbreaking in many ways. Since then, its integrated cast, message of protest and peace, and certified-platinum "rock" score have become iconic. 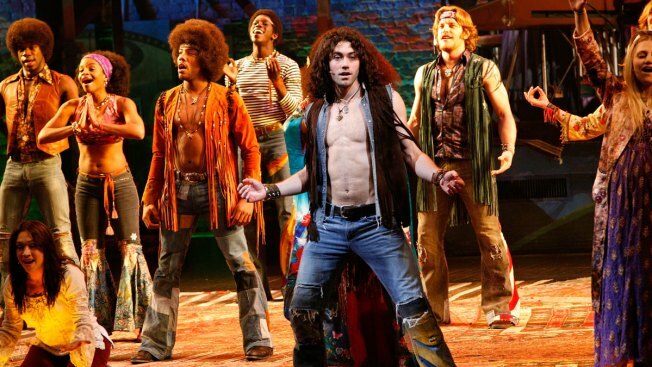 "I’m overjoyed that James Rado and Galt MacDermot are trusting us with their masterpiece ‘Hair,’ one of the most original shows ever conceived for Broadway with one of the greatest scores,” said Robert Greenblatt, Chairman, NBC Entertainment. "These songs are part of the vocabulary of popular music, and this rebellious story of young people protesting and standing up for what they believe in is as relevant today as it was 50 years ago." The 2019 airdate has not yet been announced.